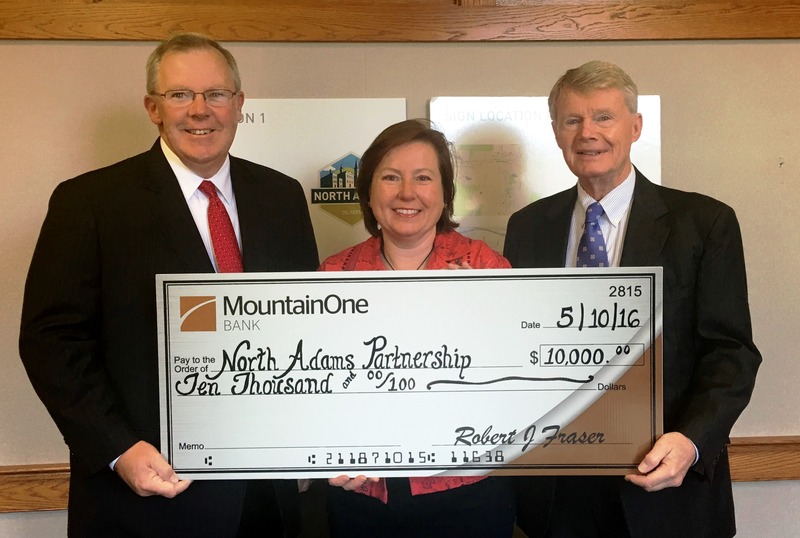 North Adams, MA – Robert Fraser, President and CEO of MountainOne Bank, was at the MASS MoCA-based offices of the North Adams Partnership to present a check for $10,000 to North Adams Partnership Executive Director Valerie Hall and Board Chairman Duncan Brown in support of new welcome and wayfinding signage throughout North Adams. The new signs and banners are being installed this week at the gateways to North Adams, welcoming locals and the many tourists who visit our area each year. Founded in 1848, MountainOne Bank has assets of over $860 million and provides a broad range of banking services supporting the needs of personal and business customers. MountainOne Bank has three full service offices serving the Berkshires, three serving Boston South, and one serving Boston North. MountainOne Bank is a subsidiary of MountainOne Financial, a mutual holding company headquartered in North Adams, MA. The following companies operate as divisions of MountainOne Bank: Coakley, Pierpan, Dolan & Collins Insurance; True North Insurance; and True North Financial (financial professionals offering securities and advisory services through Commonwealth Financial Network®, Member FINRA/SIPC, a Registered Investment Advisor). The mission of the North Adams Partnership is to enhance the economy of North Adams and establish and maintain the city’s position as a small city center of commerce, culture, education and innovation; To work closely with business leaders and local, state and federal government officials and the nonprofit sector, and to serve as a resource of expertise and creative thinking for public policy makers; To develop and incubate strategic economic development projects in North Adams and serve as the catalyst to attract private investment, and encourage the creation of joint ventures and public/private partnerships. The Partnership is a 501c3 not-for-profit corporation governed by a Board of Directors and Board of Advisors that represent a cross section of the diverse and disparate interests of North Adams and the greater North Adams region.